Here at Terrapin Hill Farm we raise organically grown produce and plants, plus pasture-raised poultry and heritage breed Duroc hogs that are also raised on pasture. We are currently just raising produce for events here on the farm and personal use. We raise Cornish Rock chickens in movable pens. These pens protect the birds from predators, but have open floors so the birds live directly on the pasture where they can freely move about and scratch for bugs. 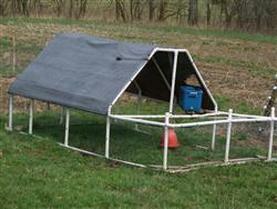 This method of raising chickens is thus called "Pastured Poultry" (as opposed to raising thousands of them together in small cages in windowless buildings). We cannot let the birds "free range" because of the risk of being attacked by predators, but this is the next best thing. The birds are fed high quality grains, and are never given antibiotics, steroids, or hormones. They don't need them because they are healthy birds living outside in the fresh air. The difference in the taste of chicken raised in this way is truly amazing, and once you try it you will not want to eat grocery-store chicken again. We raise small batches of 100 birds, 1-2 times throughout the summer. We usually have a supply of frozen birds on hand in our freezer after the first batch; if you want a fresh bird then please contact us for our processing dates. Our hogs are all pasture raised. They receive no antibiotics, steroids, hormones, or artificial supplements. They have free range to root and dig in pasture and woods, and have access to several varieties of nut trees. 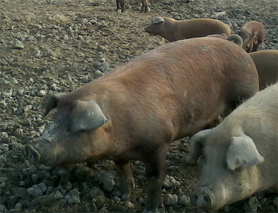 They are all Duroc heritage breed, which are known for their docile nature and their juicy, tender, flavorful meat. We raise our animals in small batches, so the products we have on hand may vary at any given time. Please contact us to see what we have in stock; we sell directly from our farm (by appointment only) or may be able to arrange delivery.